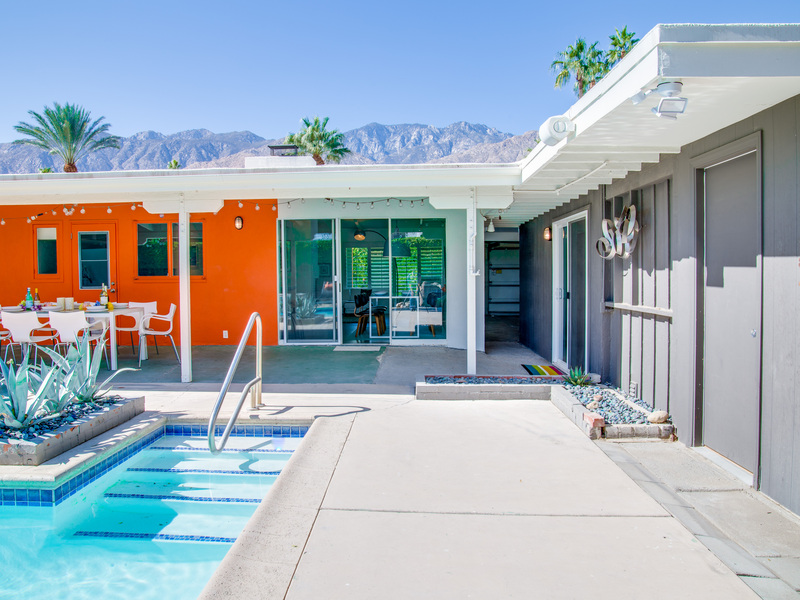 Welcome to Citrus Twist, where iconic mid-century architecture meets a private setting and gorgeous mountain views to create a fabulous vacation paradise. 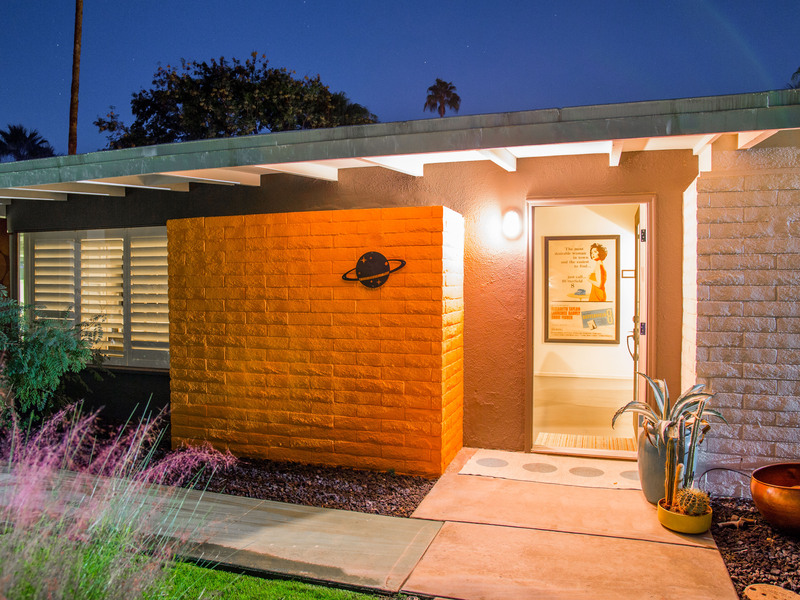 This classic mid mod home (circa 1956) has been lovingly restored - respecting its architectural pedigree while updating it for the way we live today. 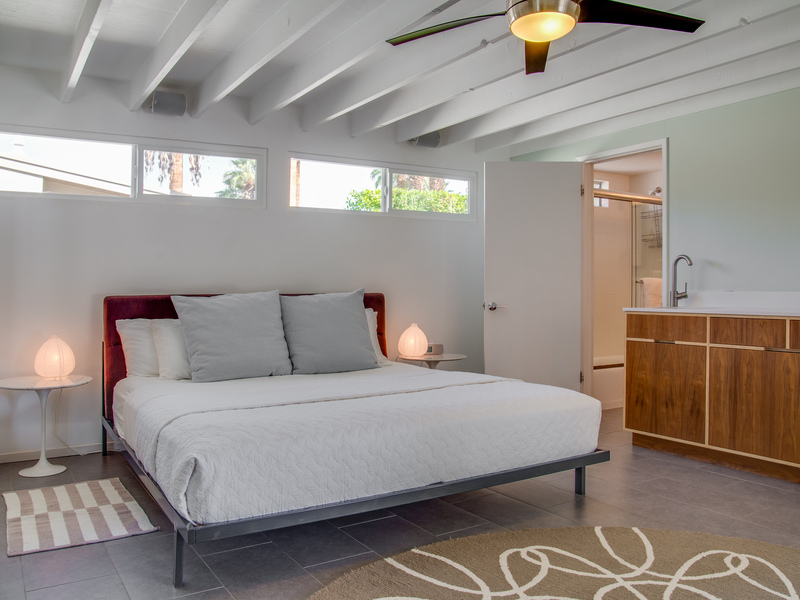 4 flat screen televisions, hi speed internet access, updated baths, gas fireplace, a misting system, and all the other modern conveniences are paired with period-inspired art and furnishings to create the quintessential Palm Springs experience. 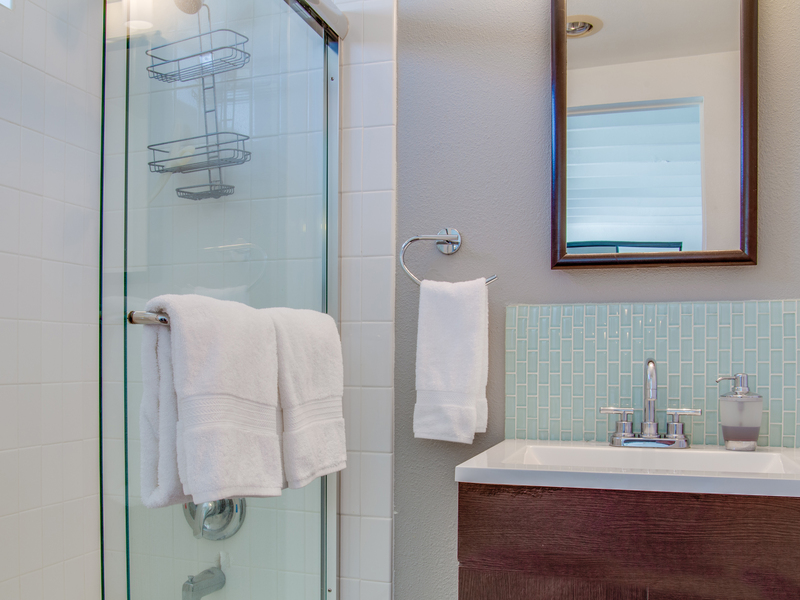 This home is bright, comfortable, impeccably clean and well-maintained. It is gorgeous in its simplicity - with an understated, unpretentious elegance throughout. You'll find clean lines, high ceilings, an open concept floor plan and spectacular walls of glass that let the light pour in - revealing the very private pool yard. 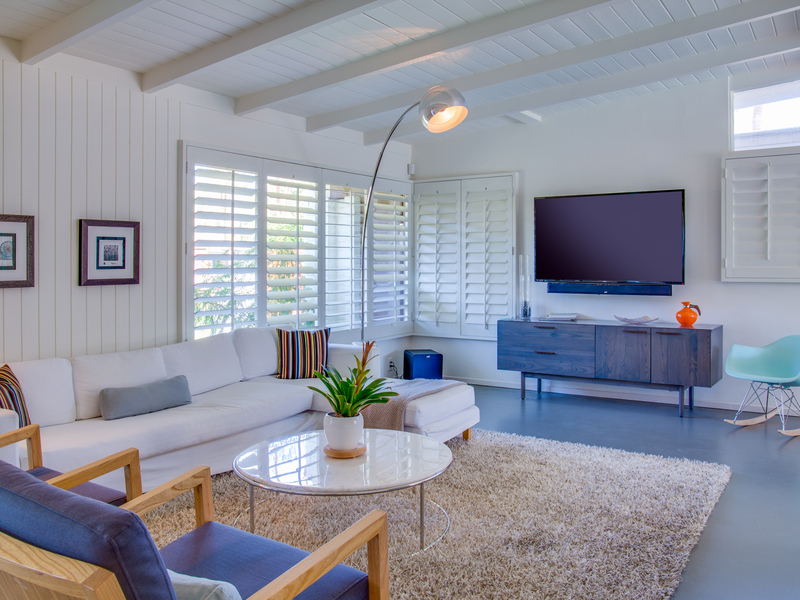 The living room, den, dining area and kitchen are all open to each other - providing enough space for your entire group to gather, relax and enjoy. 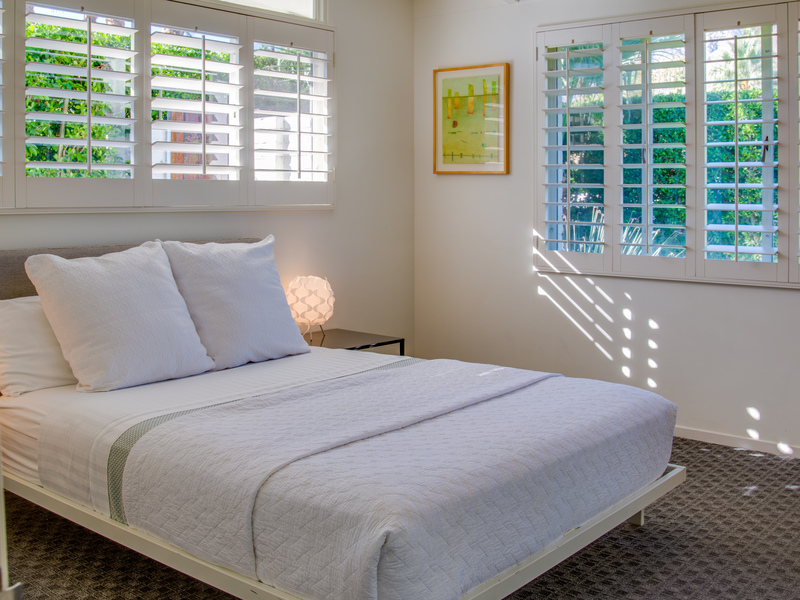 Citrus Twist offers two King-sized master suites and one Queen size suite. Two in the main house and one in the separate casita. 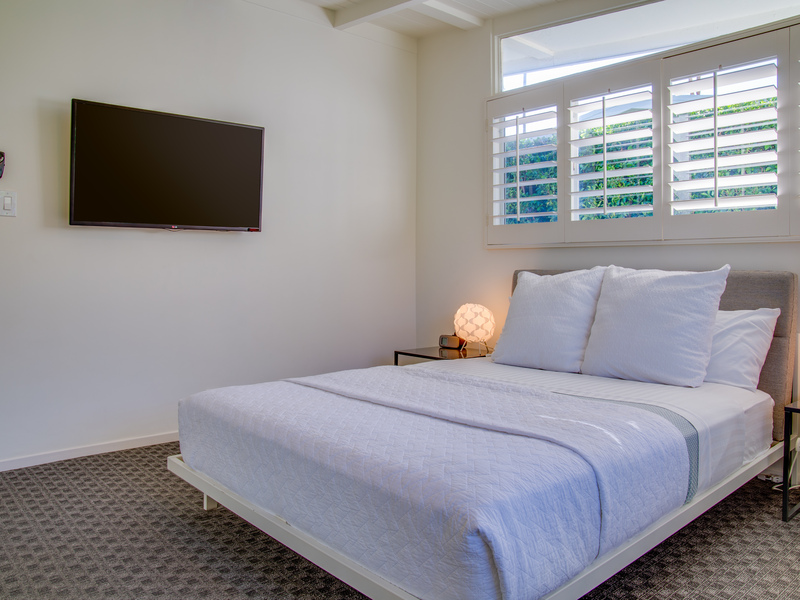 All of the bedrooms feature a comfortable hotel-quality mattress, a private bath, a flat screen television and ample storage. 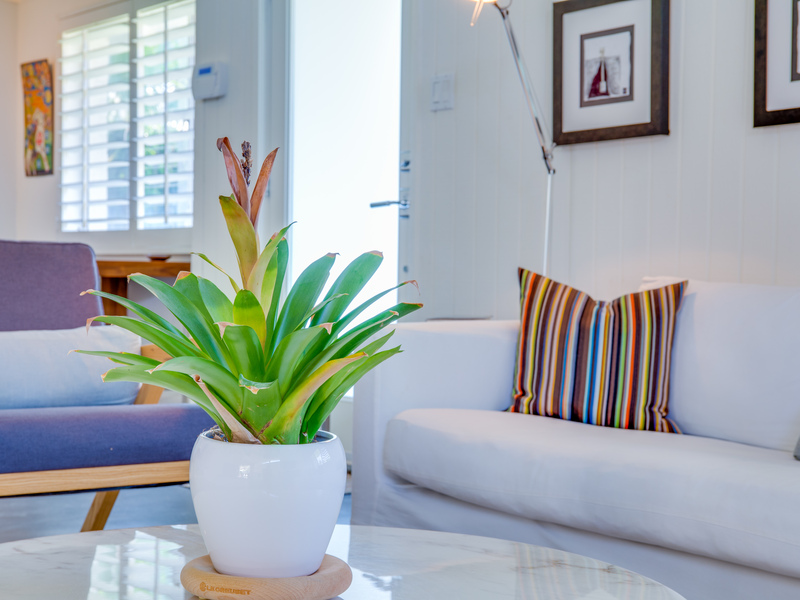 Each suite is furnished like a boutique hotel - warm, welcoming and comfortable. You are going to love it here. 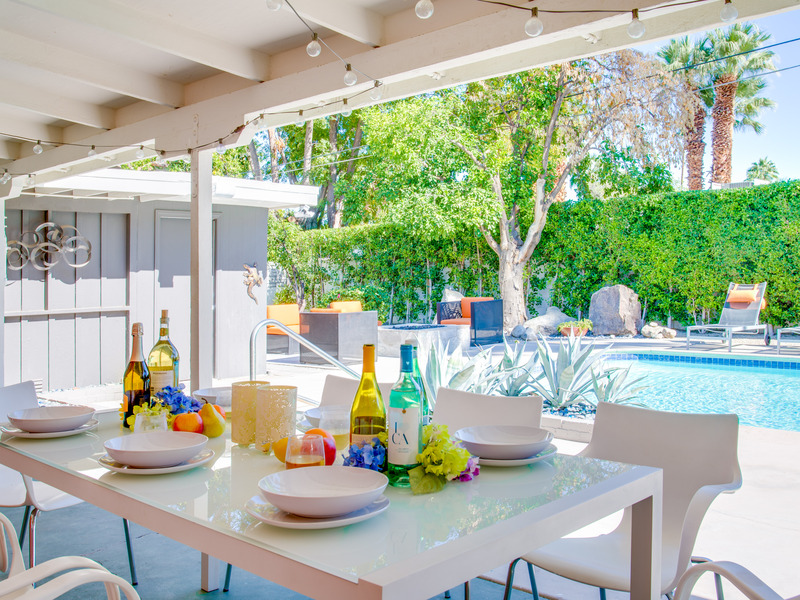 Located on a quiet residential street in the historic Deepwell Neighborhood, this property captures the magic of Southern California glamour in true Palm Springs-style. 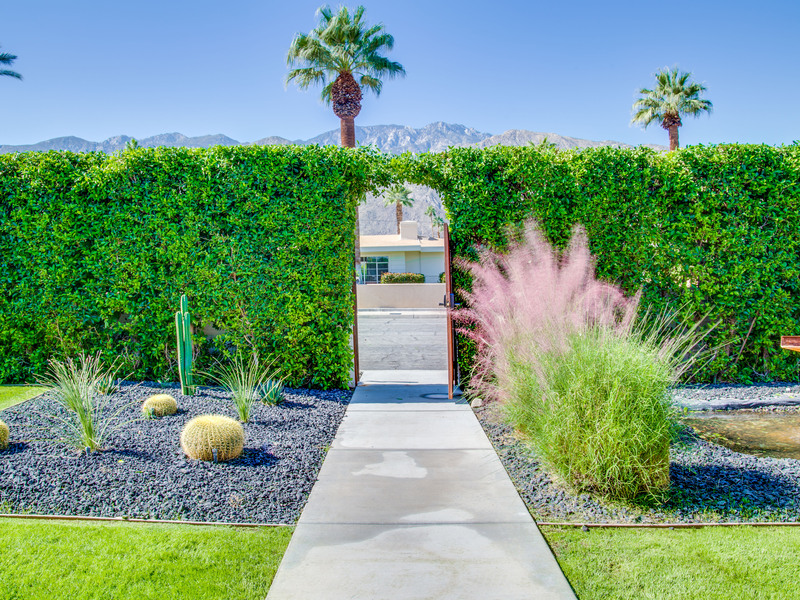 The convenient city location is softened by privacy walls, mature plantings, towering palms and gorgeous landscaping that is drought-conscious and lush at the same time. 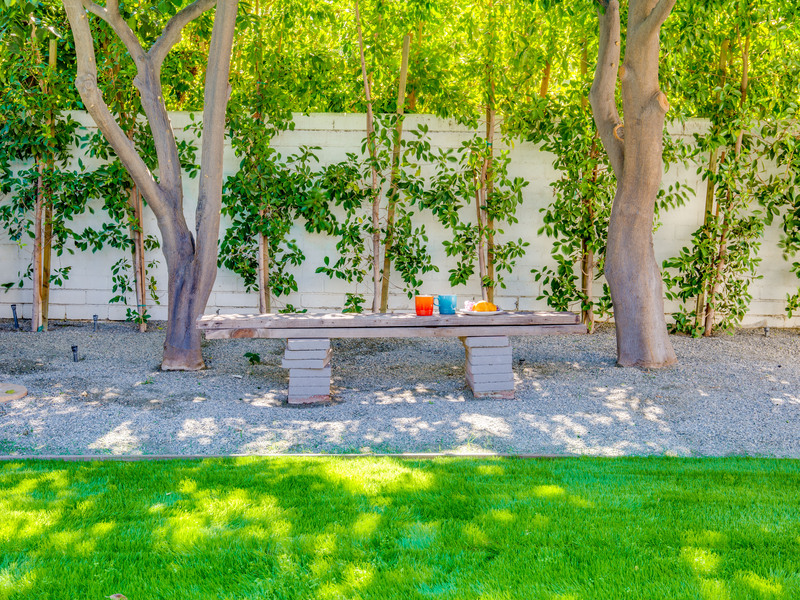 The entire property has been walled and gated for privacy and is surrounded by a 10 foot tall mature ficus hedge. The backyard itself is a slice of heaven. So private, spacious and well-planned. The awesome mountain views through the swaying palm trees is pure magic. 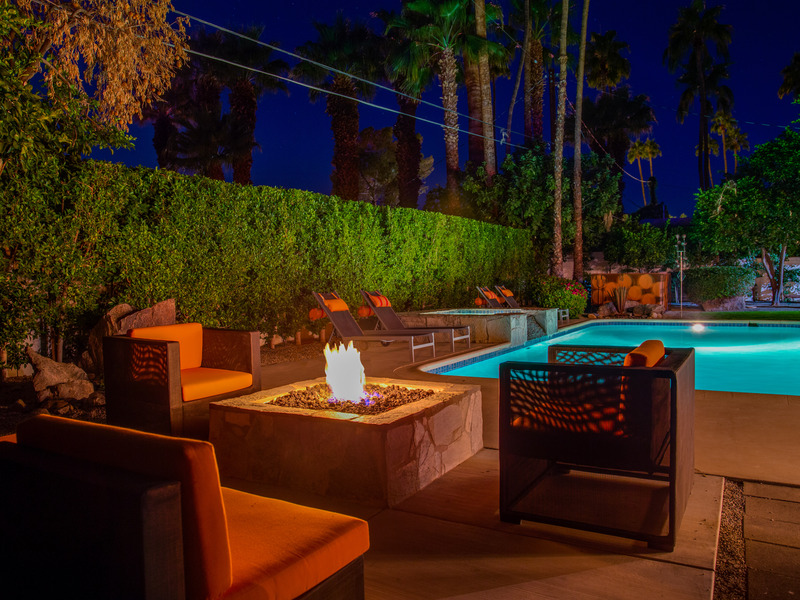 The heated inground saltwater pool with integrated waterfall spa is surrounded by the fire pit lounge and the covered dining pavilion. 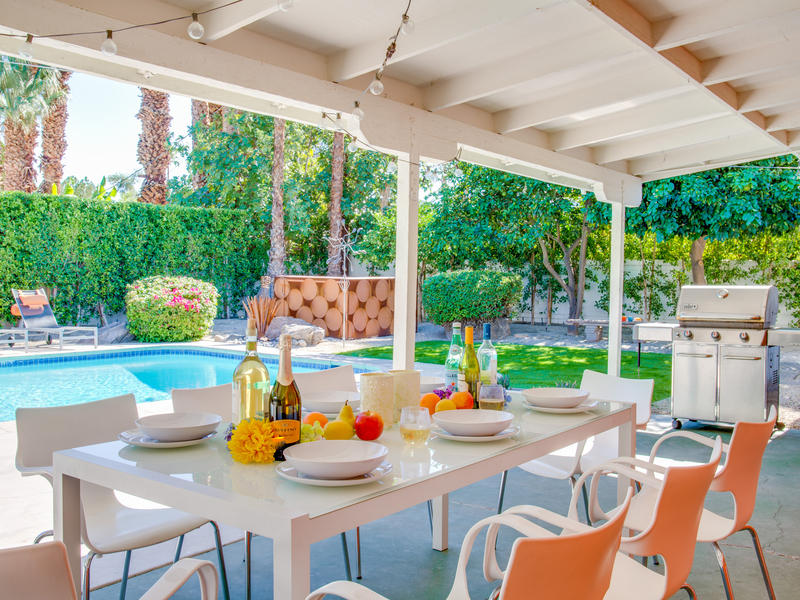 You'll find a gas barbecue, plenty of poolside chaise lounges, and a rolling green lawn that is great for kids, pets and lawn games. 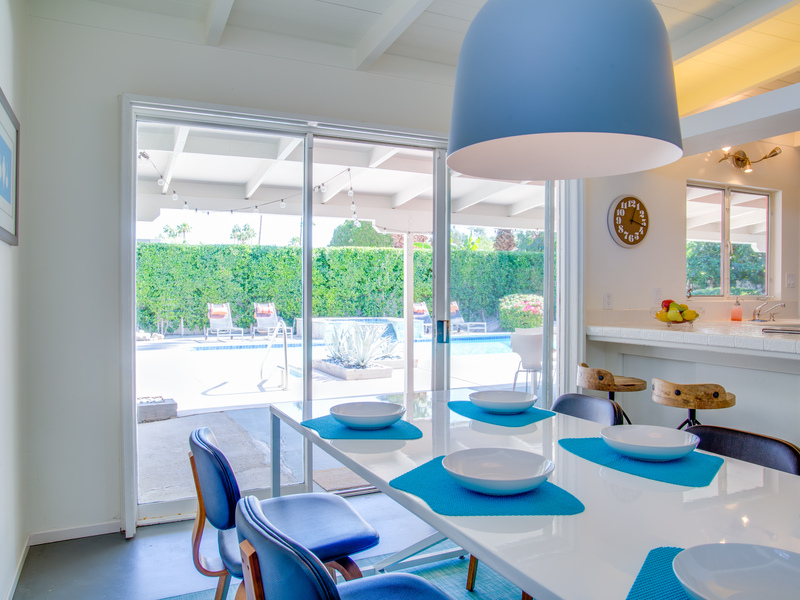 "We had a great stay and enjoyed the house and pool area.This mid-century house has been updated somewhat but has retained its original design features.The house is in a great location. It is easy to get to everything within a short amount of time. A couple of maintenance issue arose but Acme arrived quickly and made the necessary repairs." 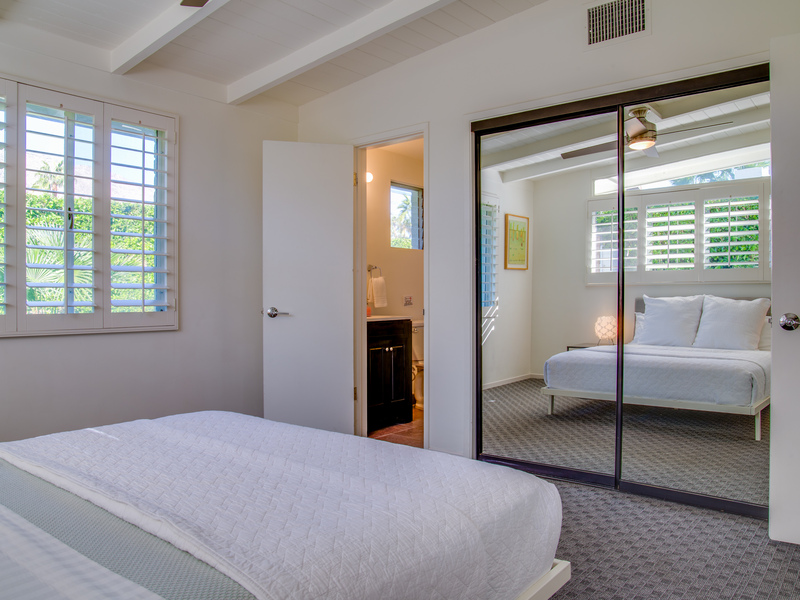 "Overall, the stay was great the house was exactly what we were expecting. It was spacious, clean and well maintained. Everything from check in to check out was well managed and made the holiday much more enjoyable. We really enjoyed our stay! The music bi-laws are a bit of a disappointment, but manageable." "This house has a wonderful pool and hot tub. 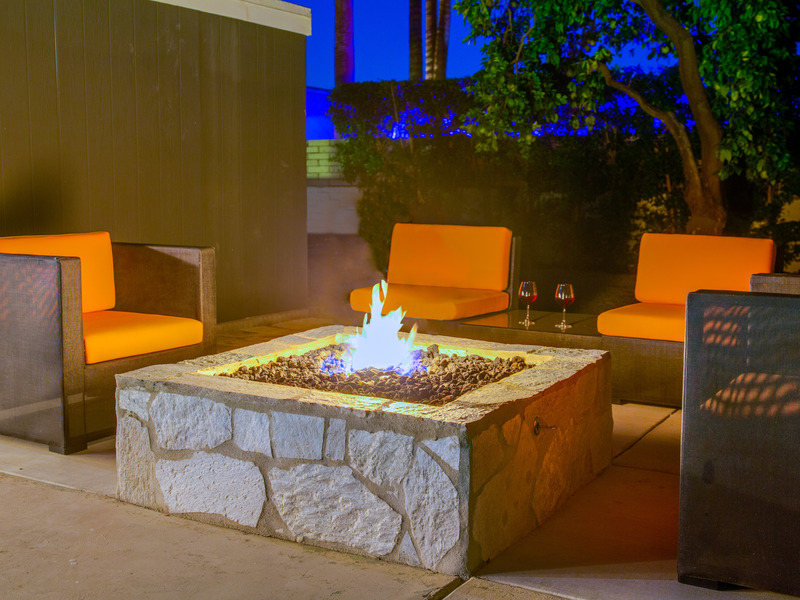 Enjoyed sitting out by the fire pit. Everything is close by and when you do want to sleep the beds were super comfy and the nice and quite. 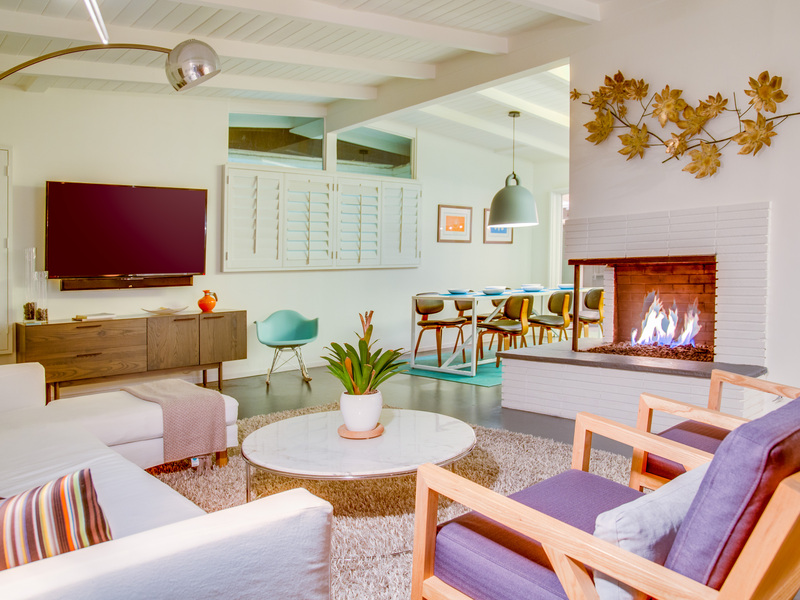 Acme made it a breeze to rent and enjoy this mid-century home. Definitely will be renting from Acme again and would sure check on the availability of Citrus Twist." 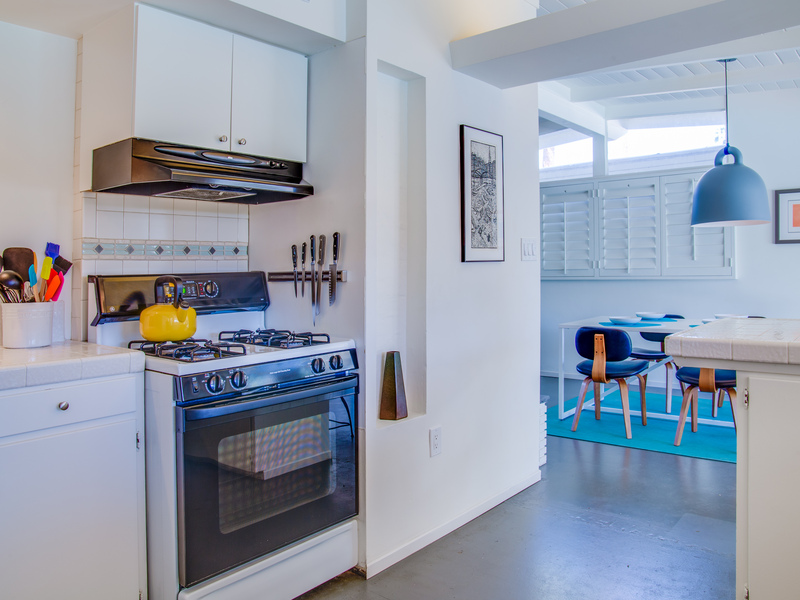 "This rental is clean, well furnished, roomy, very private lot. We really enjoyed our stay, the lovely pool, firepit and fresh grapefruits. 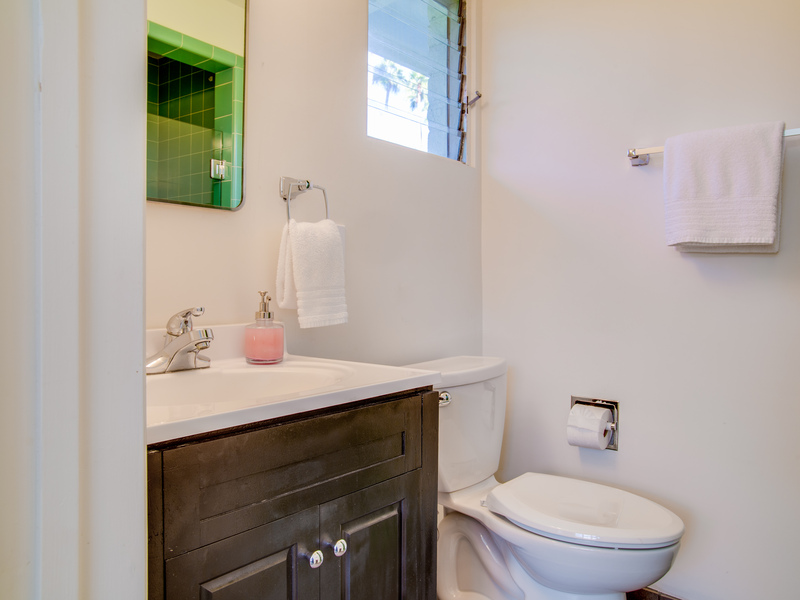 Location was very convenient in a quiet neighborhood with stores 2 blocks away and airport 5 minute drive." 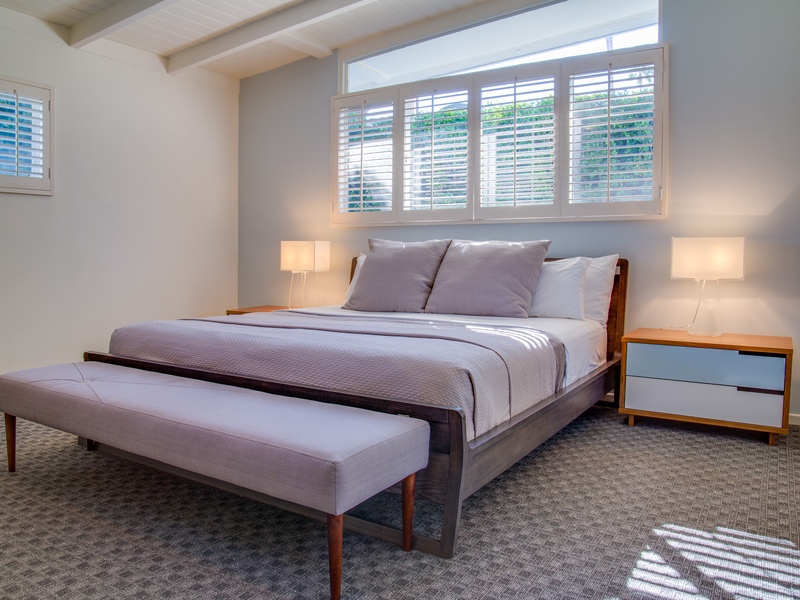 "Excellent cleanliness, and very good comfort, style, and overall stay. Thanks ACME House Co.!" "The Citrus Twist really works for us. Very relaxed, laid back vibe. Love the Deepwell location. 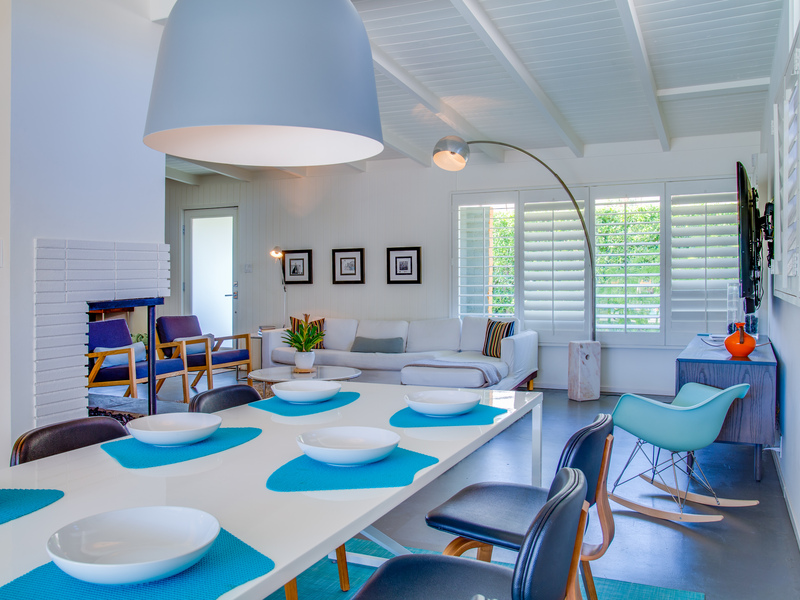 There is a simple elegance about this property that suits us and the way we like to unwind. 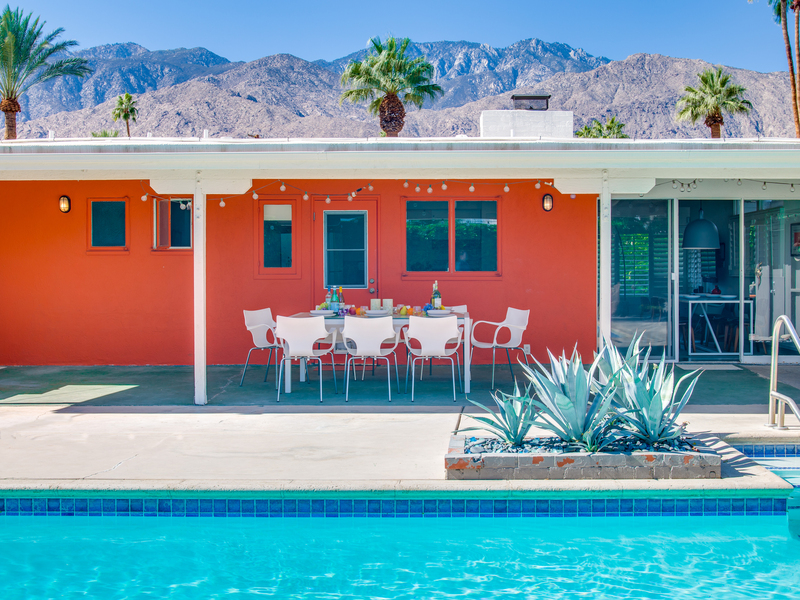 And all our trips to Palm Springs helps us know - if you want to be sure your trip is going to go well with no surprises - rent from Acme. These people know how to do it right. We have already made plans to return to The Citrus Twist in the Fall." 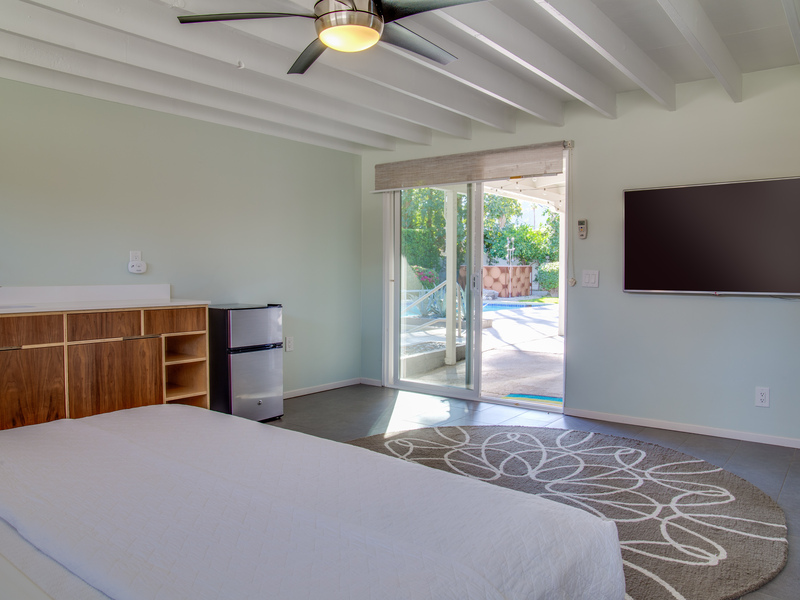 "We had a wonderful stay at Citrus Twist. 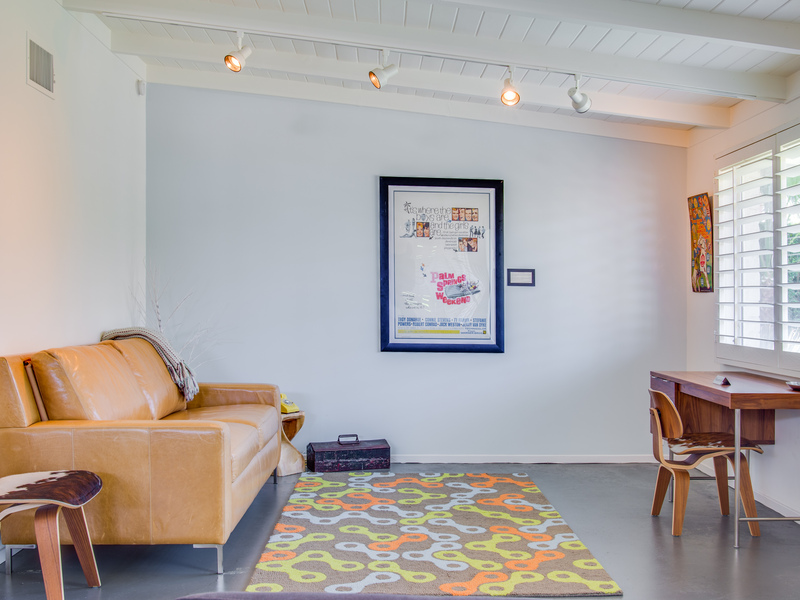 Ample room for our party of adults, teenagers and children. Quiet neighborhood with easy access to all the fun things to do in the area. We walked daily to breakfast and coffee shops. 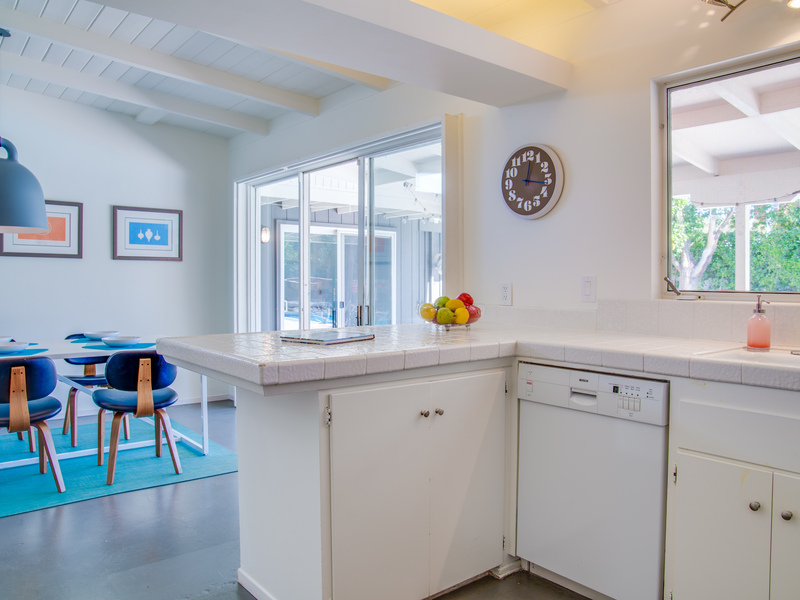 Beautifully renovated home. 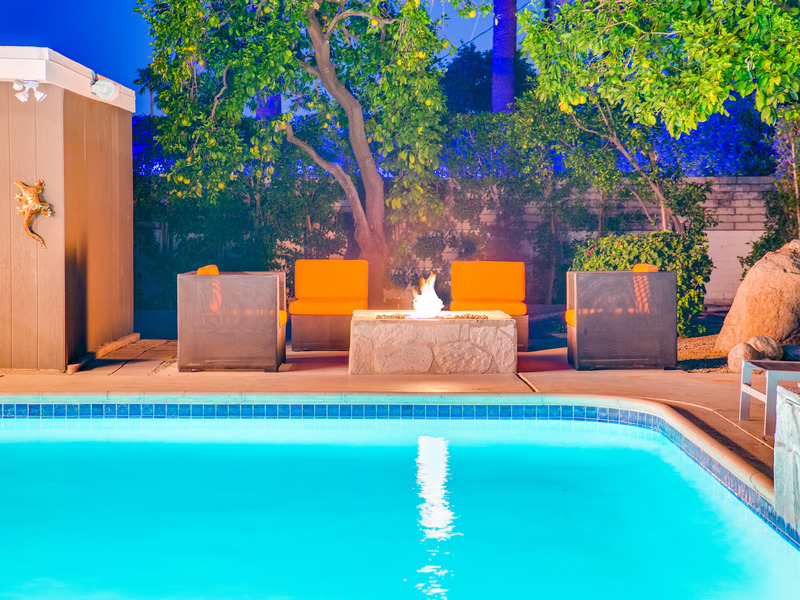 Our teenagers really enjoyed the pool and fire feature in the evenings. Great TVs in each room allowed us some downtime. Had some fun making fresh OJ and Lemonade from fruit we picked from trees around the pool. ACME was on top of everything and we hope to visit again soon." 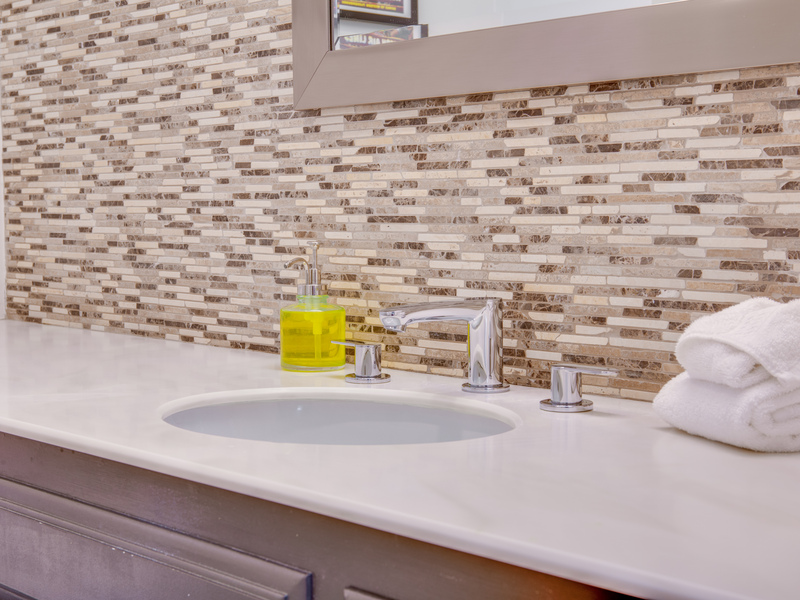 Design professionals love Citrus Twist! 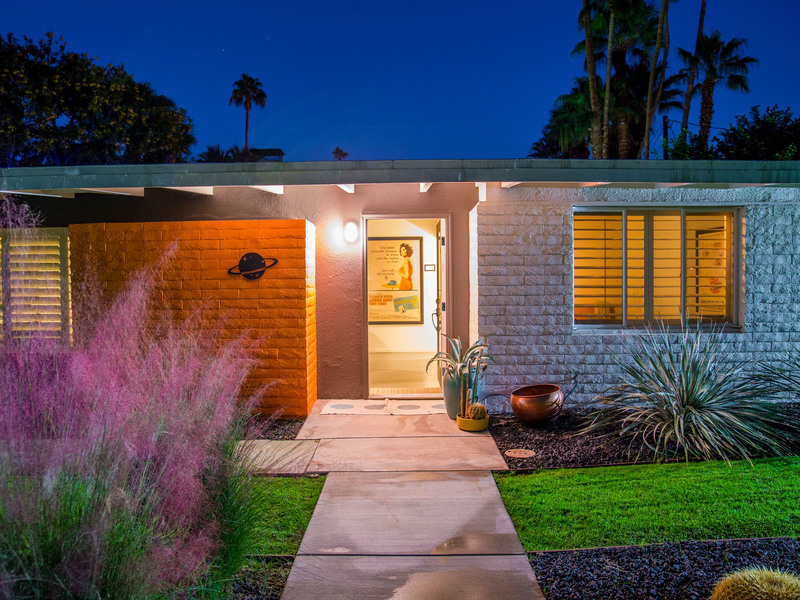 "From the moment you step thru the iron gate at the front walk, the casual elegance of this Mid-Century gem transports you to another time. Architecturally trained, my husband and I bonded with Citrus Twist...from the immaculate maintenance/era sensitive furnishings, inside and out, advanced technologies (without disturbing the vintage ambiance), fine bedding, well equipped kitchen, citrus trees from which one can harvest daily fresh fruits, to lounging in or around the saltwater pool/fire pit with friends. 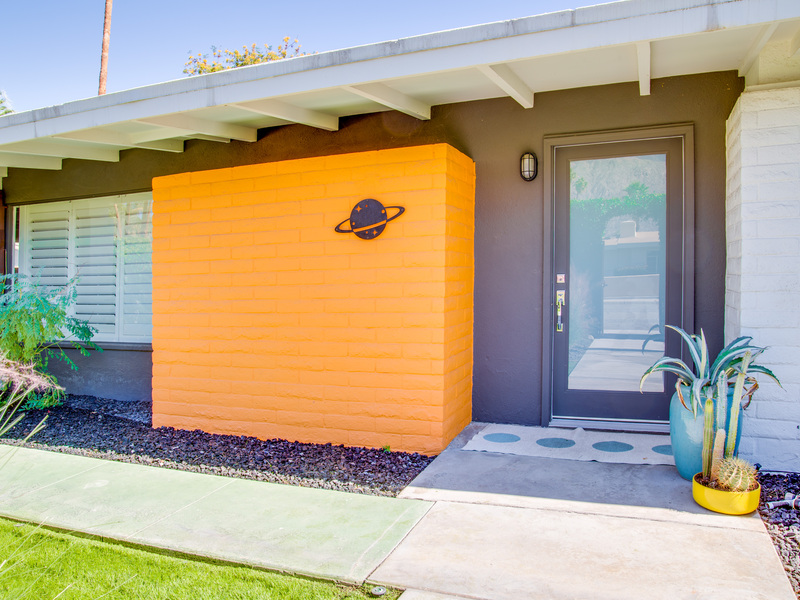 Daily walks included interactions with friendly neighbors, iconic Palm Springs architecture and local neighborhood establishments, including the amazing True Value Hardware store, which is so much more than hardware. 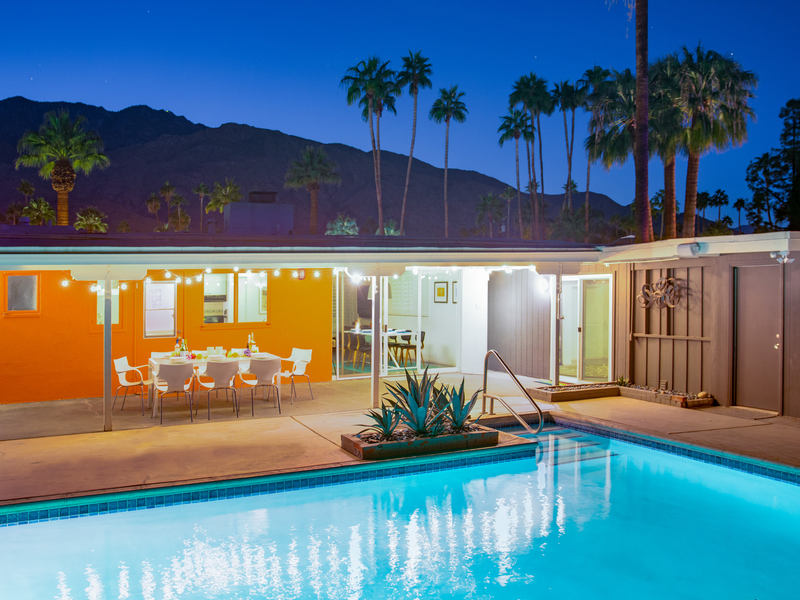 Staying at this special residence allows you to truly live like a Palm Springs native...an experience that we all deserve and one that we highly recommend." 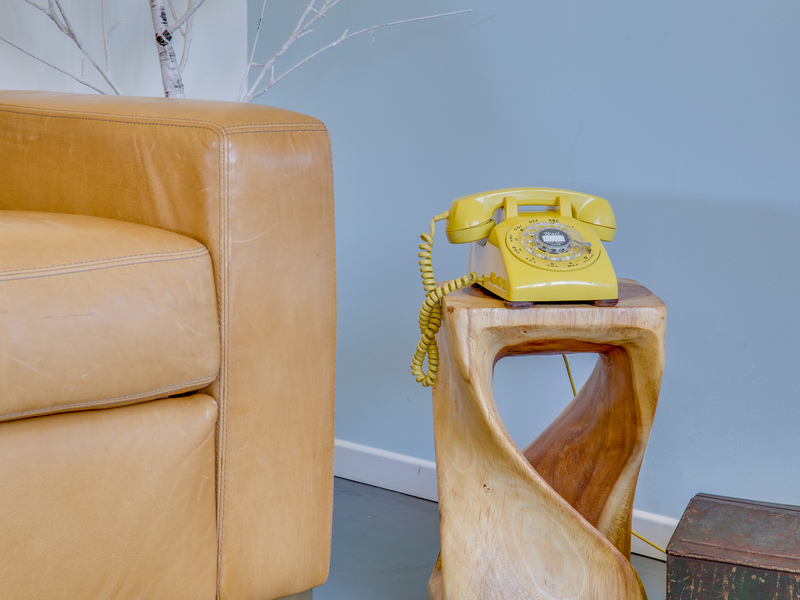 "We have been to PS before and stayed in some fairly posh hotels in the area. The experience this year, with 6 of us, was far better than having our own private bungalow suite at the finest. 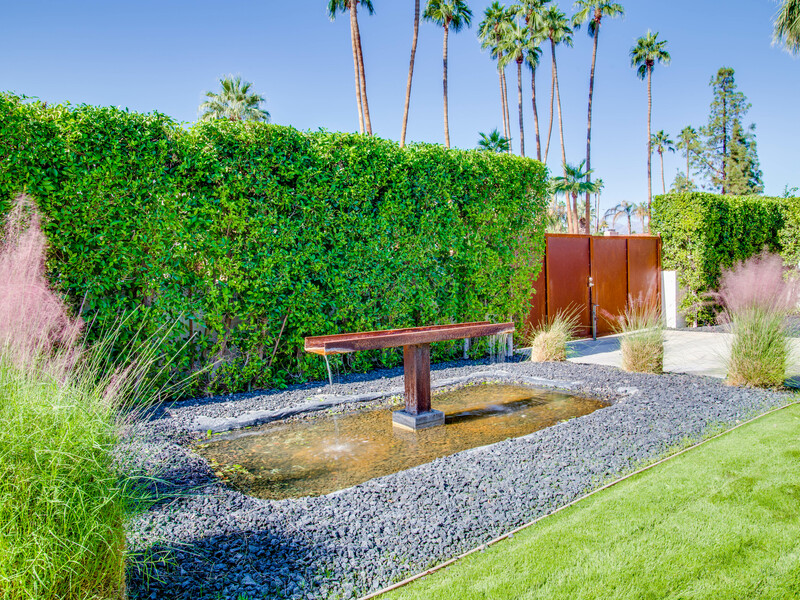 Enter through a corten steel privacy gate, with contemporary sculpture/water feature. Cozy, elegant, private, superb views, fireplace, heavenly hot tub and sizeable pool, lovely furnishings (including excellent mattresses), perfectly functional kitchen with adjacent dining, mid-century flair without being overboard, proximity to all things PS without being in the very thick of tourism. Good proximity for running in the hills (painful), shopping (excellent) and dining (excellent). 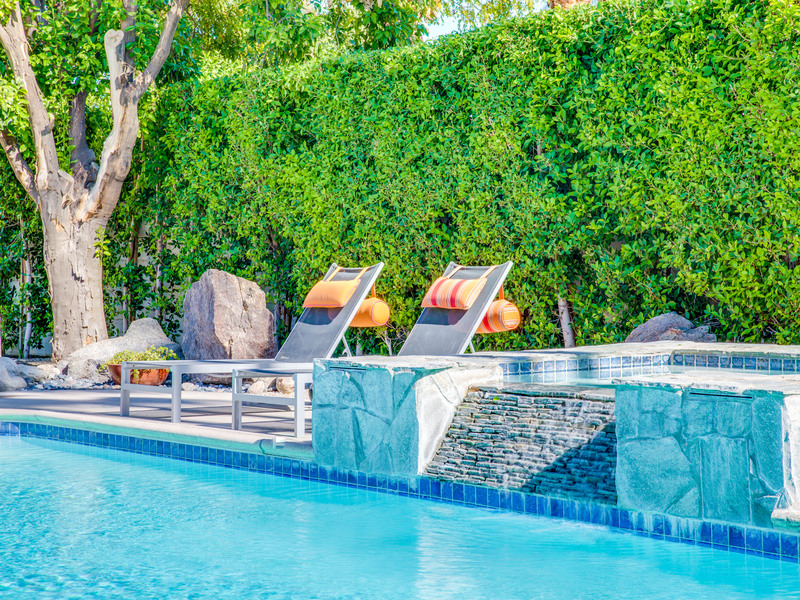 Super friendly and helpful management including superior pool and garden maintenance. Hassle-free heavenly vacation. It just doesn't get better than this spot. " "This home is the perfect getaway. 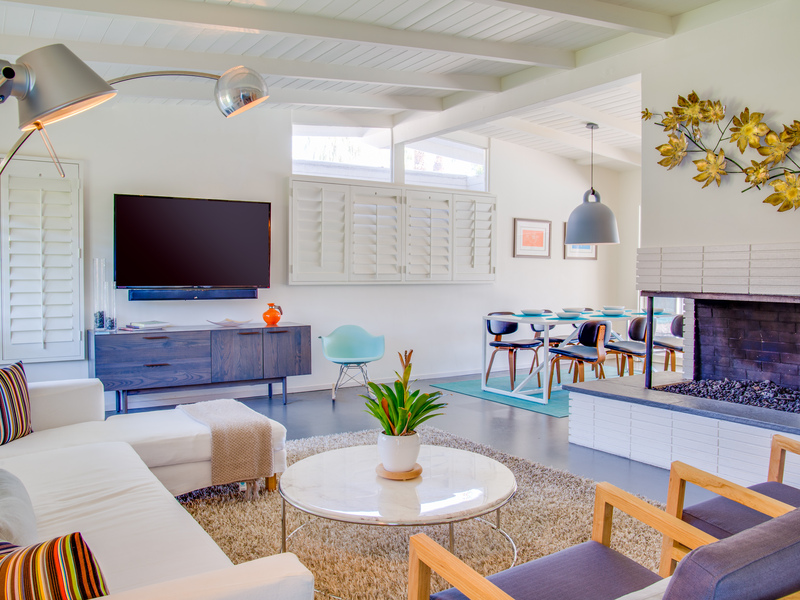 With the mid-century-modern flair going in spades, it is beautifully kept and maintained. 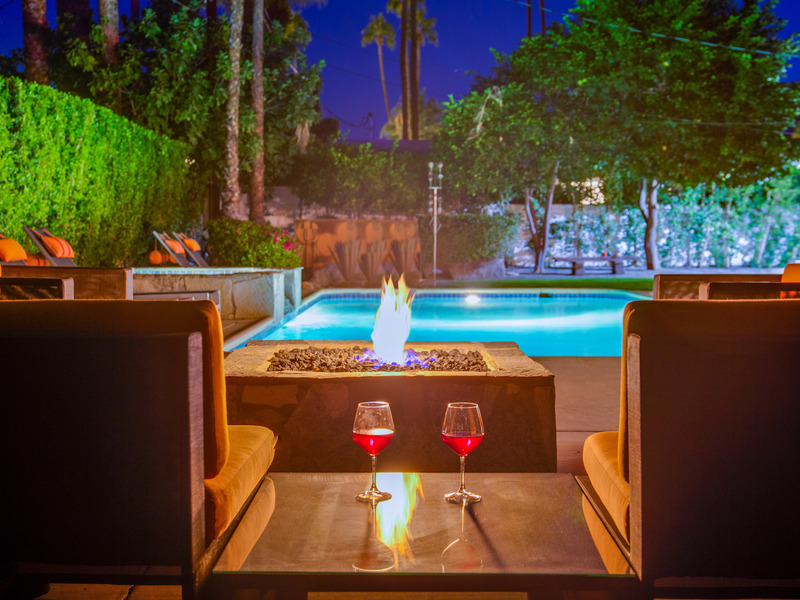 The outdoor fire pit, ping pong table, and pristine pool with raised hot tub make this property stand out. 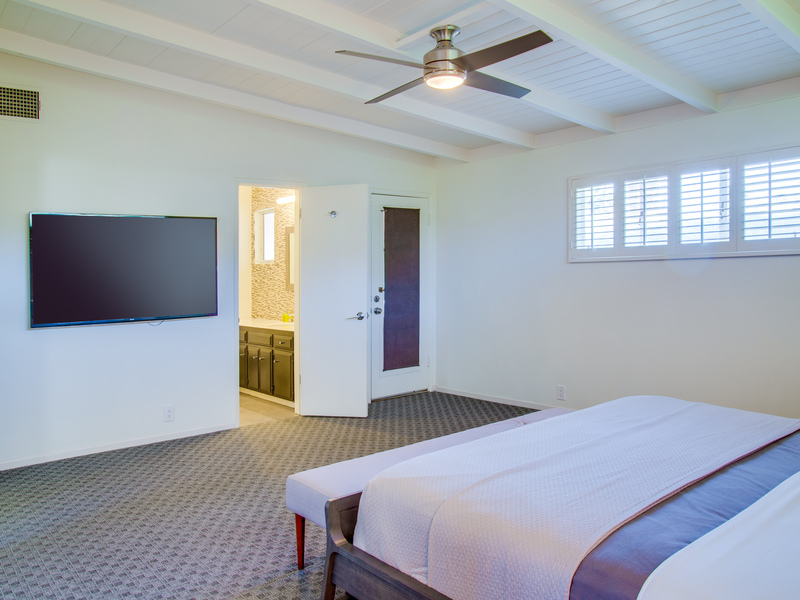 All of the bedrooms and the main living area are equipped with flat screen TVs and full cable access. 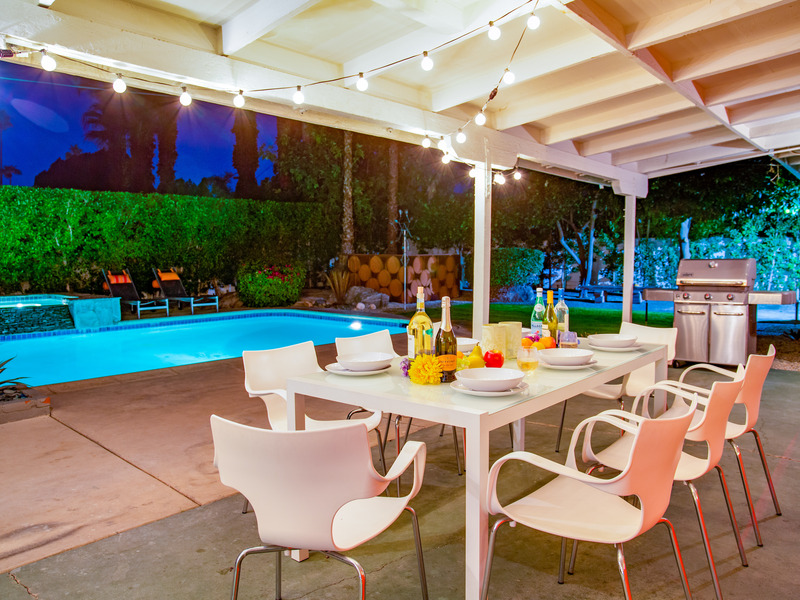 The indoor and outdoor dining areas are festive and inviting - perfect for late-night card games or hosting a dinner for friends. 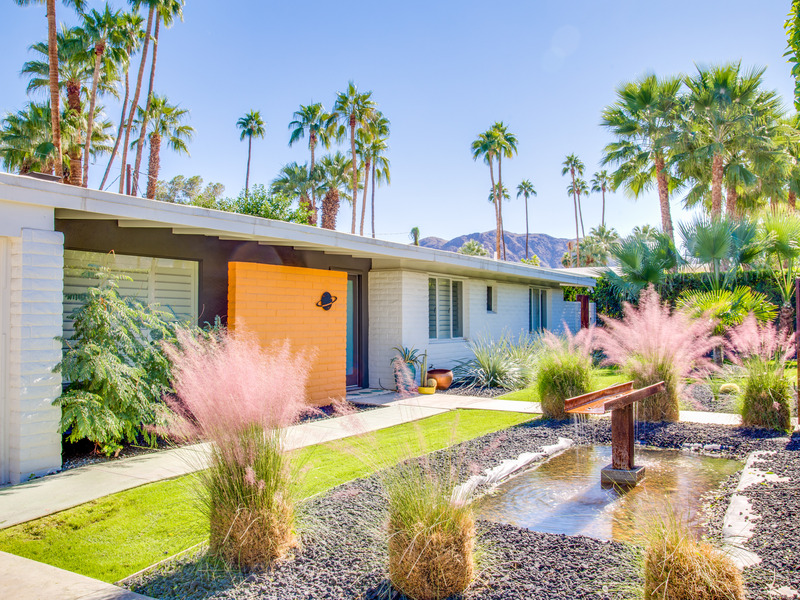 It is just minutes from downtown Palm Springs, the airport, and anything else that you could possibly want from a Palm Springs getaway vacation. My spouse and I enjoyed our stay at this property and have come back several times. 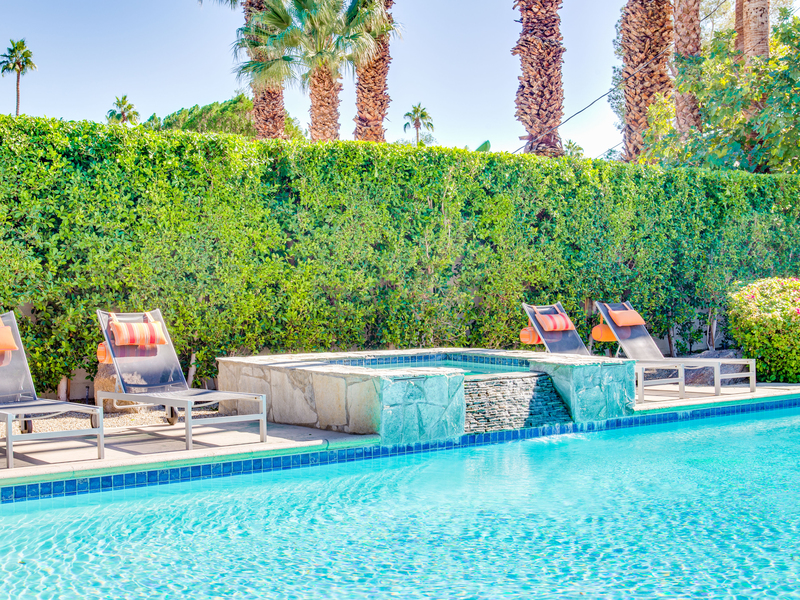 We recommend it to all of our friends traveling to Palm Springs. It does not disappoint!!" "I love this home. Spacious and immaculately clean, this property has everything: three large bedrooms with attached bathrooms (including two with king-sized beds), a nice-sized, pristine pool with comfortable deck chairs, private and secure setting on a nice quiet street, beautiful hot tub, fire pit next to the pool/hot tub, well-equipped kitchen, wi-fi, A/C, and big-screen TVs in every bedroom. 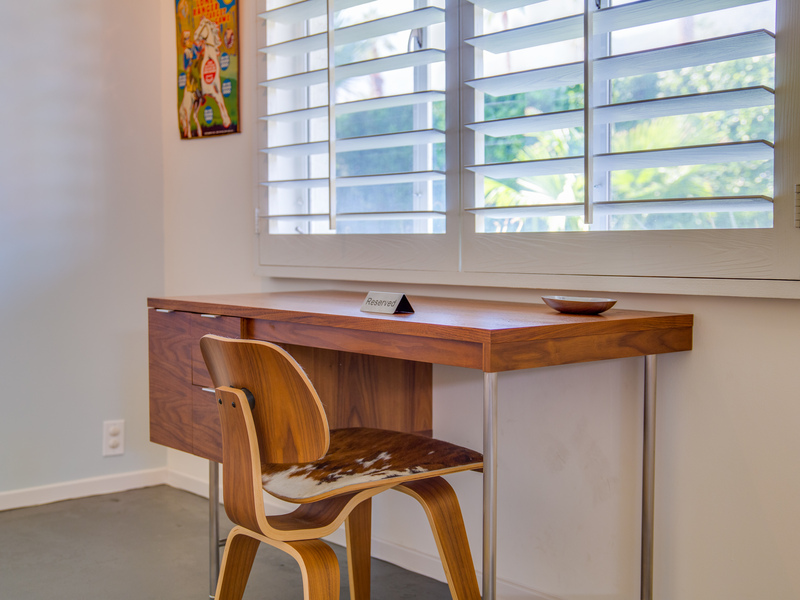 In addition to all of this, the attention to interior and exterior design detail and mid-century modern flare makes this place really special. We HIGHLY recommend this home and prefer it to any resort. " "Absolutely Delightful! I love this home! Spacious and immaculately clean, this property has everything: three large bedrooms with attached bathrooms (including two with king-sized beds), a nice-sized, pristine pool with comfortable deck chairs, private and secure setting on a nice quiet street, beautiful hot tub, fire pit next to the pool/hot tub, well-equipped kitchen, wi-fi, A/C, and big-screen TVs in every bedroom. 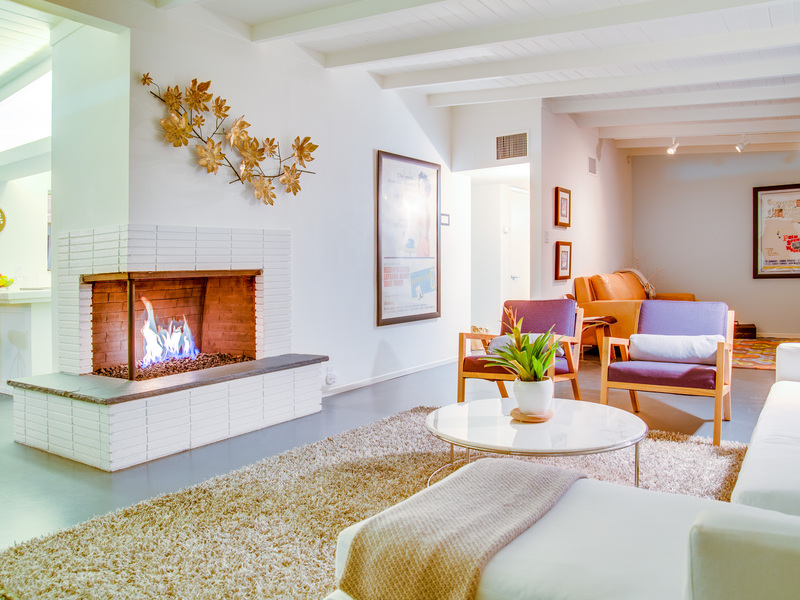 In addition to all of this, the attention to interior and exterior design detail and Mid-Century Modern flare makes this place really special. We HIGHLY recommend this home and prefer it to any resort. " 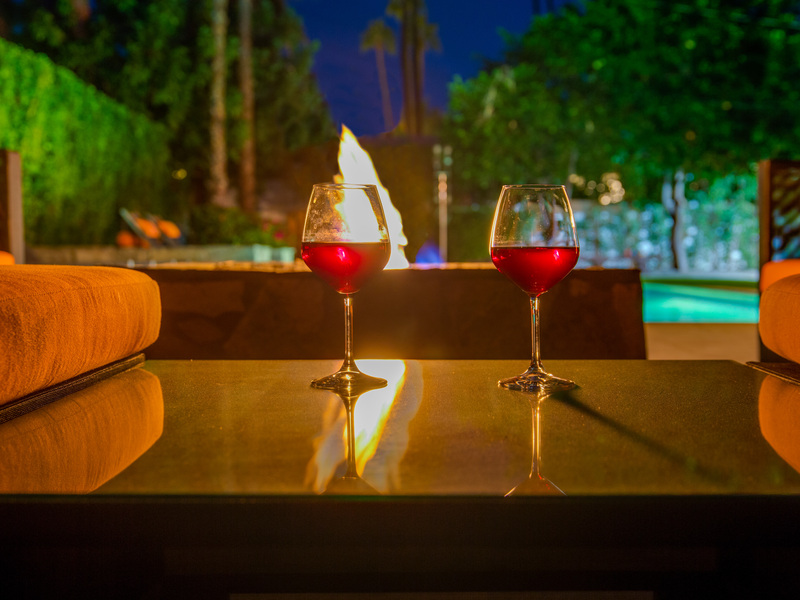 "We usually come to the desert once or twice a year and stay at the Westin Desert Willows property but decided to treat ourselves to a whole house this time. 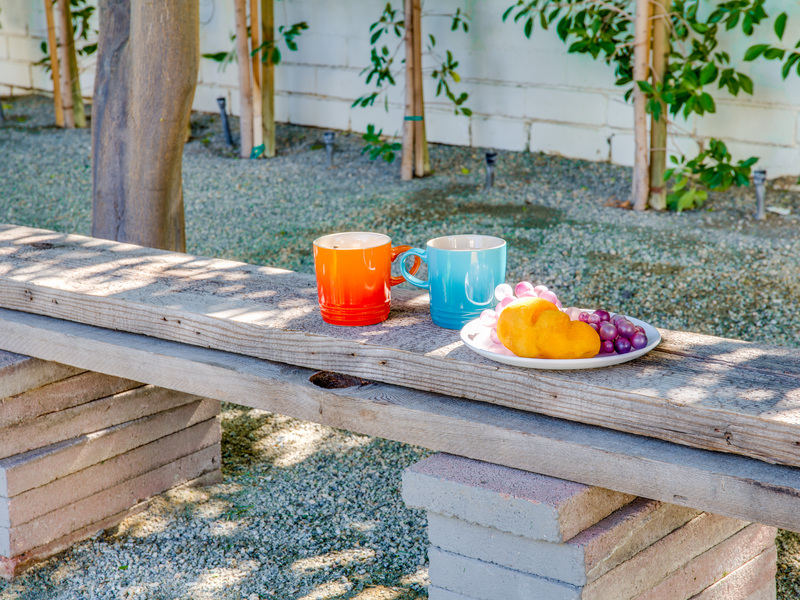 Everything is as pictured and the grounds are immaculately maintained. 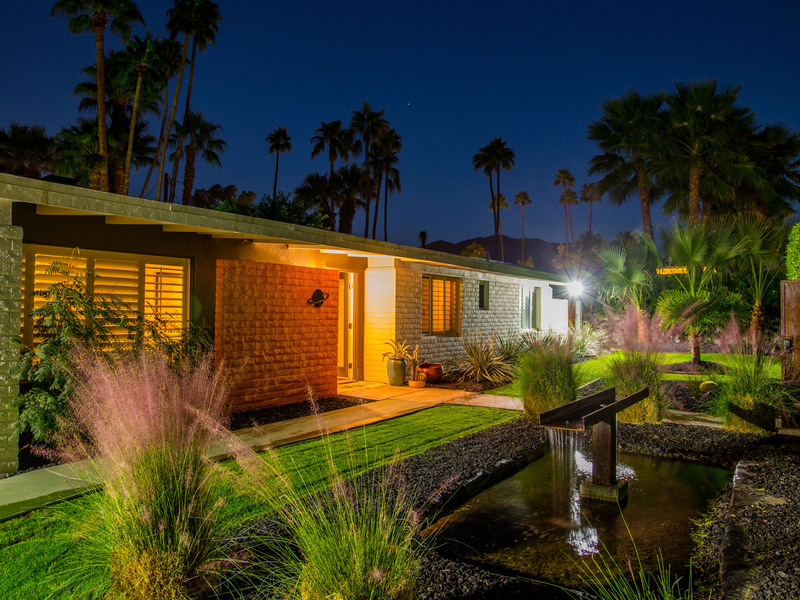 The location was centrally located and we did not have to travel very far to any of the golf courses we played, grocery shopping, restaurants, and downtown Palm Springs. The house was secure and very private, behind an iron gate, and we did not hear any street noise. It was so nice to have a pool to ourselves and be able to wander in and out of the house to get food and drinks and use the bathroom (without going across a parking lot and up an elevator). 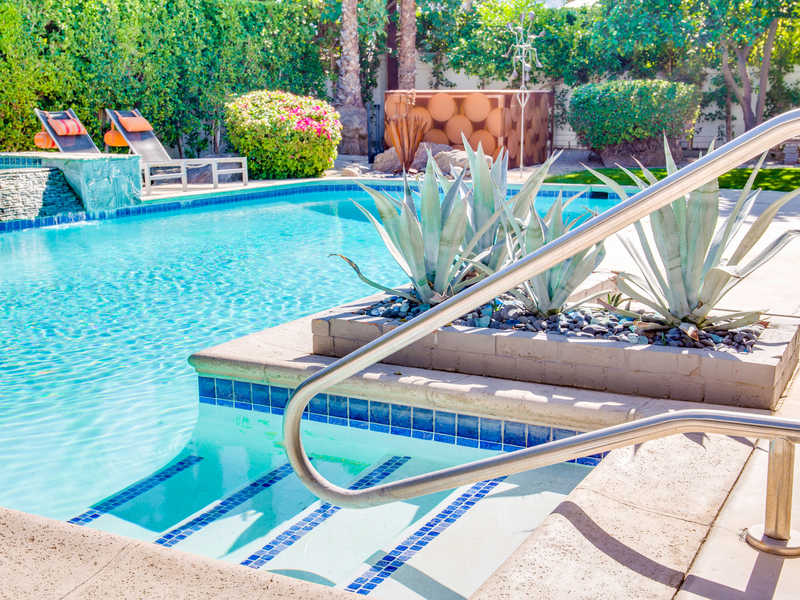 It will be hard to go back to a shared pool at a condo. We hosted a BBQ one evening and had everything we needed - a plus was the high end kitchenware and all the Gladware for leftovers. The ping pong table in the garage was a big hit with our guests. There were only two of us and we each took a master in the main house. I would definitely come back with my friends and think it would sleep 6 of us comfortably." 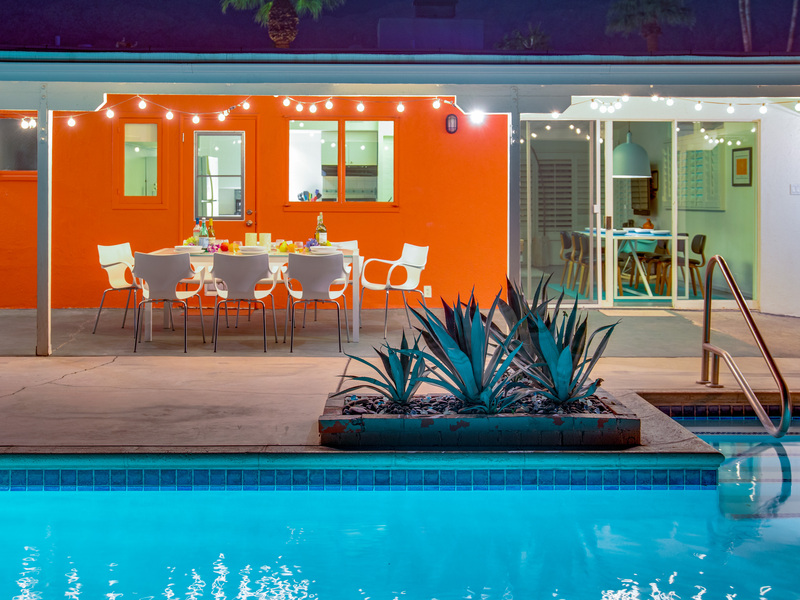 Design Professionals Love Citrus Twiest! "I brought my favorite golf foursome to this house for a long weekend. We had a tremendous time. You are surrounded by those incredible mountains, more championship golf courses than you can play (PGA West! ), hiking, eating and drinking. We had a blast and cannot wait to come back. I envision making this an annual golf vacation. 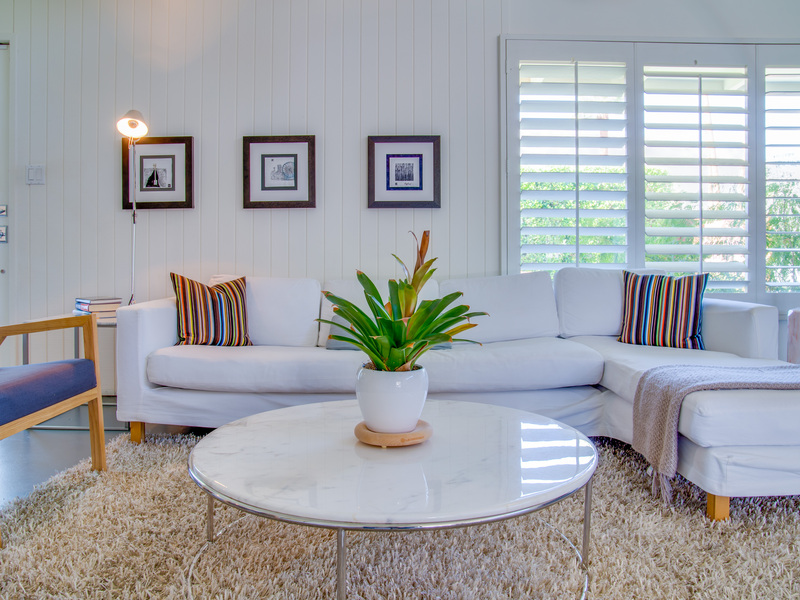 The house is great; clean, comfortable and nicely furnished. Beds were very comfortable and enjoyed being able to watch baseball in bed after a long day on the links! So much fun!"